Supercharged Nissan NISMO Micra Coming To India? Nissan is planning to launch its Supercharged Nissan NISMO Micra in India soon in 2015 as per the sources. The term NISMO comes from Nissan Motorsport which is the motorsports and performance division of Nissan company. NISMO cars are known to participate in Super GT and FIA GT global championships. NISMO Micra if launched at competitive price in India, is going to attract a lot of buyers with its sporty looks and high performance. The ongoing Nissan Micra is available in five diesel and three petrol variants in India. The petrol variant, under the hood comes with 1198 cc 3-cylinder petrol engine which churns out 75 BHP of maximum power at 6000 rpm and 104 Nm of peak torque at 4000 rpm. It is mated to highly efficient 5-speed manual or automatic transmission . The diesel variant on the other hand is powered by a 1461 cc engine . It churns out 64 BHP of maximum power along with 160Nm of peak torque. It mated to a 5-speed manual transmission . The dimensions of the car are 3780 mm x 1665 mm x 1530 mm (length, width and height respectively) with a wheelbase of 2450 mm. While Nissan NISMO Micra is powered 1.2 liter supercharged petrol engine which churns out 114 BHP of maximum power and 156 Nm of peak torque, mated to either a 5 speed manual gearbox or a CVT automatic gearbox. This car will be more sportier and sturdy than existing model of Micra. It will also be equipped with different alloys (16 inch), sporty steering, aggressive styling, integrated LED lamps and damper. 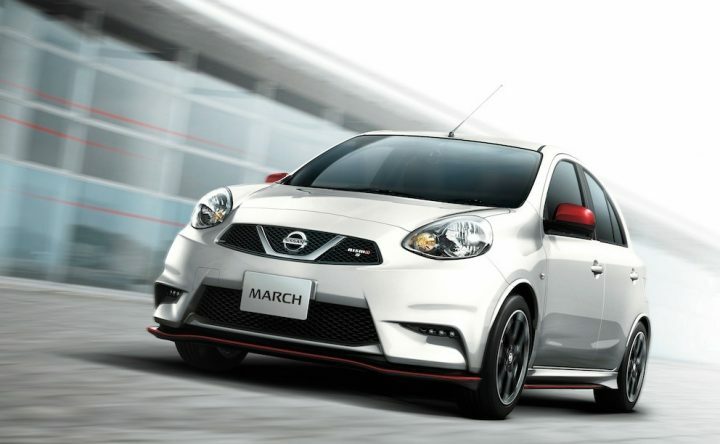 This supercharged NISMO Micra will compete with Volkswagen Polo, Fiat Punto Sport, Skoda Fabia and Hyundai i20 Sportz. Volkswagen Polo GT TSI is powered by a 1.2 litre turbocharged petrol engine which churns out 103 BHP of maximum power at 5000 rpm and 175 Nm of peak torque at 1500-4000 rpm. It is mated to a 7-speed dual-clutch automatic transmission. It is available at a starting price of Rs. 8 lakh (Ex-showroom). Fiat Punto 90 HP Sport is powered by 1.3 litre multijet diesel engine producing 92 BHP of maximum power and 209 Nm of peak torque and it is mated to a 5-speed manual transmission. Skoda Fabia 1.2 TDI CR is powered by a 1.2 litre turbocharged diesel engine displacing 1199 cc, it produces 75 PS power at 4200 rpm and 180Nm of peak torque at 2000 rpm and it is mated to a 5-speed manual transmission. Hyundai i20 Sportz AT 1.4 is powered by 1.4 litre petrol engine which produces 100 BHP of maximum power and 136 Nm of maximum torque while it is mated to 4-speed automatic transmission. Nissan Micra has been quite successful and it is one of the most selling cars in India, now lets keep our hopes high with its sportier sibling launching soon. Though the timeline for its launch has not been revealed yet, we expect it to be launched in early 2015.